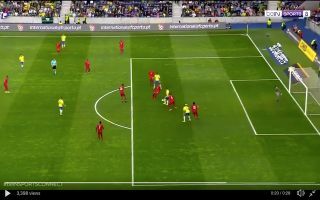 Liverpool forward Roberto Firmino showcased his amazing skill this evening during Brazil’s match with Panama, the Reds star showed off a sublime touch and layoff. In the second-half of Brazil’s clash, the 27-year-old managed to expertly control a cross that was coming into the box, Firmino laid the ball off to Lucas Paqueta and the AC Milan star’s shot on goal was saved. Firmino’s insane layoff sent one of the commentators into overdrive and rightly so, the fact that Firmino managed to do this by barely looking is mesmerising. Liverpool will need Firmino to be firing at all cylinders if they are to beat Manchester City to the Premier League title, the run-in to the end of the season will be one of the most tense in years.